​Winter is coming. We promise, it really, finally is. Yes, HBO's ridiculously popular "​Game of Thrones" is set to return for its final season tonight. The show has an absolutely massive global audience, and it's all people seem willing to talk about lately. 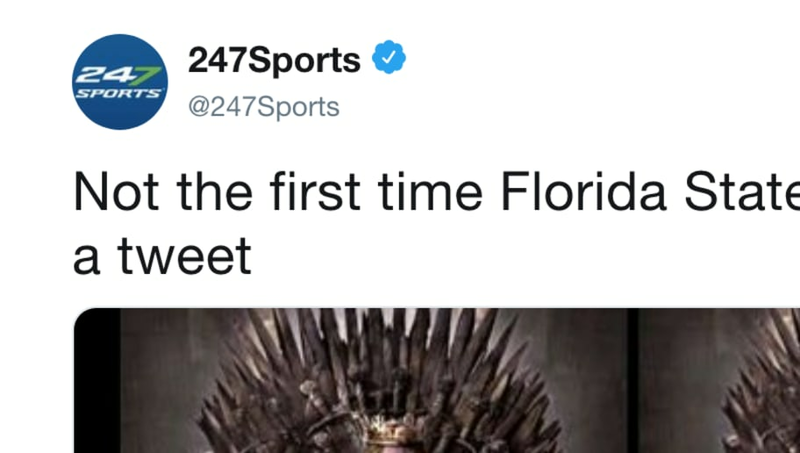 With that in mind, the Florida State Seminoles Twitter team decided to get with the times and post an edit of the iconic Iron Throne, cropping the faces of quarterback James Blackmon and defensive tackle Marvin Wilson over the face of... Ned Stark! Spoilers below! Yes, Ned famously got the ol' devil's haircut at the end of the first season of the show. Is FSU Twitter intending to suggest that one of its star players is going to be decapitated this year? They could have at least done a better Photoshop job. The tweet didn't receive the reaction they were hoping for. Rightly, the post was ridiculed to the point where the account deleted its edit altogether. Even former and current Seminoles stars took to social media to laugh at their alma mater for what was nothing short of a complete failure. Hell, Wilson himself even gave a response, making clear that this was not his idea. When the player in the edit takes to social media to clear up his lack of involvement in the picture, that's when you know things have gone disastrously wrong. It's not even the fact that the post was just outright unoriginal, but it looks like the social media team didn't even put in any effort when making the edits. This ​isn't the first time Florida State's Twitter has garnered some negative press, as they have actually been the cause of their own demise a handful of times. Need I mention their senseless Martin Luther King Jr. Day tweet? There may need to be some new creative minds running the show for Florida State's Twitter account, as the people in charge now have made some questionable judgment calls in the past.